CFCA is not a one-size-fits-all organization. We rely on our field staffs to know the families in each community, to listen to their needs and hopes, and to provide a program that empowers them to build a path out of poverty. We give you a window into several CFCA communities, to gauge the success of the Hope for a Family sponsorship program. Rose and Patrick proudly display some of the items they sell at their art gallery. A stone art gallery is tucked away down a bustling street in Nakuru,Kenya. Inside, beautiful wood and glass pieces, intricately woven baskets and skillfully sewn dresses are displayed across the spacious room. The owners, Patrick and Rose, are passionate about their work. Like entrepreneurs around the world, they honed their skills and opened this shop as a way to provide for their family. Patrick and Rose are part of the CFCA family in Nakuru, Kenya. Their son, Kevin, is sponsored, and Rose is a member of a CFCA mothers group in the area. The family was able to attain a loan to start their business through Rose’s mothers group. Patrick smiles widely as he describes how far theyíve come as a family and just how much CFCA has helped them. 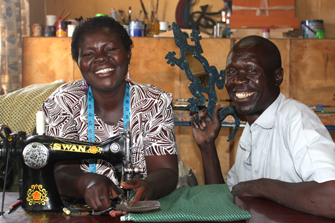 “We have received loans that have boosted our artwork business, and we are slowly rising above poverty. We have food to eat and a place we call home. CFCA has made us grow economically and we are very grateful. “The art gallery we started has really improved our living conditions as a family. We have one child sponsored through the CFCA program, and we are now able to pay the school fees for our other children as well as provide other basic needs. Patrick, Rose and their family demonstrate the goal of the CFCA program in Nakuru, and around the world: to empower families to become self-sufficient and live a life full of dignity and hope. Rose, a social worker in CFCA-Nairobi, describes the Hope for a Family program in Nakuru. 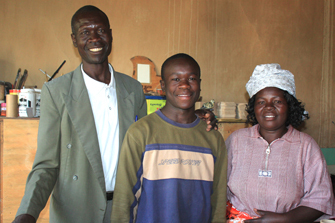 Parents Patrick and Rose with their son Kevin, who is sponsored through the Hope for a Family program in Kenya. Many of our CFCA sponsored friends and their families are from very humble backgrounds. We usually encourage them to start income-generating businesses so they can move closer to achieving economic self-sufficiency. The livelihood programs vary from farming, tailoring and selling vegetables to making art pieces. Each family is different from the others in terms of talents and resources, so they pick a program that is tailored to their needs. The livelihood programs enable families to have more security, better shelter and a greater ability to provide for their basic needs. The self-esteem and dignity of the families has increased because they are slowly rising above poverty. The CFCA community is seen as a well-rounded program, meaning it is not about handouts. Individual families are making an effort toward sustainability, which is one of the core elements of the Hope for a Family program.